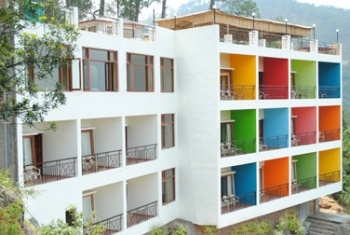 Pratiksha Himalayan Resort is a deluxe hotel situated in Kausani on Baijnath Road. It is surrounded by oak and pine trees forest and tea garden. Pratiksha Himalayan Retreat offers unobstructed views of the majestic Himalayan range and the Garur Valley of Baijnath. The 24 years of experience in hotels industry makes Pratiksha hotel in Kausani in serving the guests with best comfort and delicious food. The aim of Pratiksha Hotels is to give value for money. The resort serves the travellers with modern facilities and a comfortable stay with warm hospitality. Pratiksha hotel in Kausani is located 2 Kms from Kausani Bus stand and market on Baijnath Road. The resort is 2 Kms from Tea Garden in Kausani. Rudhradhari temple and waterfall are nearest from Pratiksha Himalayan Retreat Resort. Someshwar is 11 Kms from Kausani. Accommodation in Pratiksha Hotel is categorized as Luxury Room, Super Deluxe Room and Deluxe Room. There are a total of 21 luxuriously furnished rooms facing the imposing Himalayan range with private balconies. There are 12 Luxury Rooms designed for those who want to experience the ultimate comfort and luxury. All rooms are equipped with attached baths and round the clock hot and cold water supply. Hotel Pratiksha Himalayan Retreat in Kausani houses a Multi-Cuisine Restaurant and a Roof Top Coffee Shop. The restaurant serves delicious food and the Coffee shop affords enchanting views of the Himalayas. Multi Cuisine Restaurant Serving Indian , Chinese , Continental And Special Mouth Watering Kumauni Food. - Dormitory And Food Arrangement For Drivers, Nature Guide Available, Travel Desk. Kausani is well connected by road and Pratiksha Himalayan Resort is 419 Kms from New Delhi, 115 Kms from Nainital and 52 Kms from Almora. From Delhi, one has to take NH24 to Rampur, from there NH 87 leads to Almora. A state highway connects Almora with Kausani. In case you do not want to drive a car from Delhi, you can take Bus from Delhi ISBT - Anand Vihar. The nearest railway station from Kausani is at Kathgodam.